There is nothing like cinnamon, in pies, cakes, rolls, it has the IT factor. I recently went to Oaktown Spice Shop in, you guessed it, Oakland! I live just up the road and walk in sometimes just to see what he has mixed recently. I love people watching in this slice of France, and enjoy listening as he asks the guests what they are making for dinner. One trick I learned by going to the spice shop is that you should always ask what has been freshly ground that week. If it has been ground recently it is immeasurably better than the other herbs and spices, and beyond compare with supermarket, even local! So go out and find that local spice shop, there has to to one near you, and if not, start one! Cinnamon had just been ground so I splurged for the extra fancy saigon cinnamon, which means it was the first grind, extra dark, and sweet smelling/tasting. 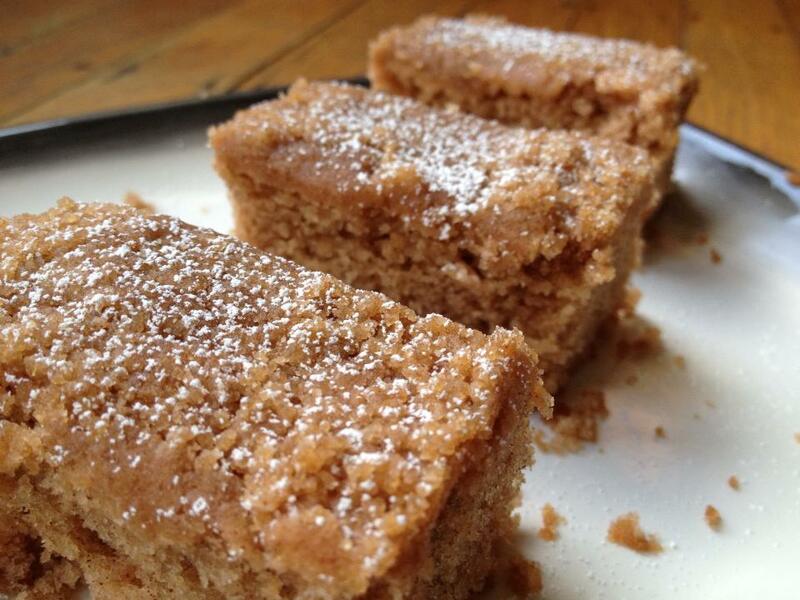 I have been making many things with this cinnamon but most recently I made a cinnamon crumble cake that will please any omnivore. So buckle up and enjoy the ride to fluffy vegan cake land, its time you arrived! This rendition of crumble cake is a correct application of commercial egg replacer, as it creates a great texture that holds together, and doesn’t end with an unpleasant finish (thank you cinnamon). This recipe is adapted from Sweet Vegan. 1. Preheat oven to 180 degrees Celsius or 350 degrees Fahrenheit. Grease and flour a 9×13 in pan (23x33cm). 3. Next beat the butter substitute, sugar, and vanilla extract until combined. Scrape down the bowl and beat the mixture for two minutes until it fluffs up. 4. In a smaller bowl mix together the flour (don’t forget to sift), baking powder, and cinnamon. In a separate bowl combine the wet ingredients, the egg replacer, milk alternative, and vinegar. Alternate adding the wet and dry ingredients to the mixer bowl and after each addition beat for 10 seconds or so. Don’t forget to continually scrape down the sides of the bowl so everything gets mixed well. After all ingredients are added beat for 30 more seconds. 5. Spread the cake mixture into the prepared baking tin and sprinkle on the crumble topping evenly. Bake the cake for 45-50 minutes or until a toothpick stuck in the center comes out clean. Sprinkle with the icing sugar and invite over guests, you shouldn’t eat this whole tray alone!